The Exchange – What’s in it for me? The Exchange enables artists, cultural and creative SMEs and ECRs to collaborate on research and enrich the ecology between the arts, creative industries and Universities. 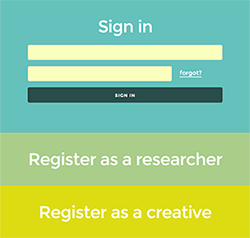 For ECRs, The Exchange creates a range of opportunities to collaborate with practitioners and SMEs in the creative and cultural industries on research. The Exchange creates opportunities to build relationships with ECRs from partner HEIs who are seeking to collaborate on research led projects. We are launching with four regional networking events. There are 30 Collaborative Research Awards available. Our resources include guidelines and FAQs.